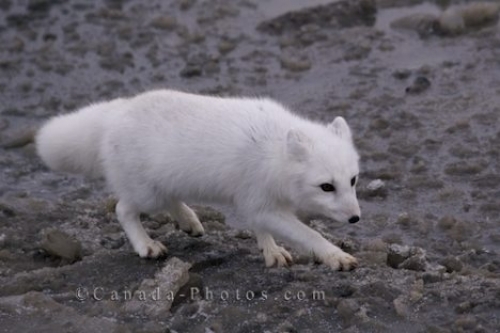 During the winter season along the shoreline of the Hudson Bay in Churchill, Manitoba, passengers aboard the tours will often see an Arctic Fox foraging for food. The snow white color of the Arctic Fox is camouflage for this mammal during the winter and as spring approaches the fur of the Arctic Fox changes with the landscape hues. Picture of an Arctic Fox adorned in its snow white coat foraging around the coastline of Hudson Bay in Churchill, Manitoba.